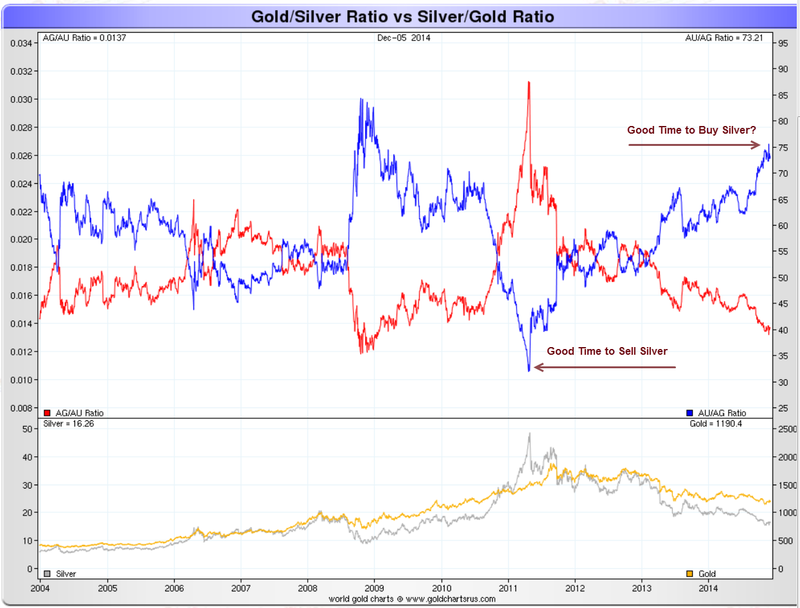 Last Friday I decided the gold:silver ratio was so out of line that I swapped some of my gold for silver. The ratio is a measure of how many ounces of silver it takes to buy an ounce of gold. My exchange rate last Friday was as follows: "USD 38.2355/goldgram & USD 16.3589/silver ounce" where 1 gram (g) of gold Equals 0.032 troy ounces (oz t) in gold. Simply stated, I traded some of my gold at $1194.859375 for an equivalent dollar amount of silver at $16.3589. This does not constitute a recommendation, I am merely stating what I did. 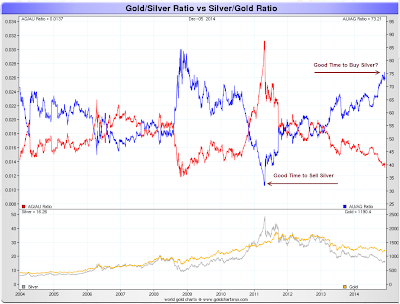 On April 27, 2011 I announced Taking Silver Profits - Swapping Silver for Gold. At the time, silver was roughly $46 and gold roughly $1500. Since I sold every ounce I had that was a good move. My next move wasn't that great. On May 1, 2012 I announced I'm Swapping Some Gold for Silver. Fortunately I only bought back about 1/3 of what I sold. Here was my exchange rate: "USD 53.4986/goldgram & USD 30.9600/silver ounce". My expectation all along was for silver to dip to the low $20s but a couple rebounds from the high 20s to the 30s caused me to change my mind. Fortunately I had more patience on this add, and I just bought the rest of my silver-relative-to gold allocation. Time will tell if "gold at $1194.859375 for an equivalent dollar amount of silver at $16.3589" is a good trade, but I like my chances. The above chart courtesy of Nick at Sharelynx Gold, also known as Gold Charts "R" Us. Nick has a free week on his charts. Gold Charts "R" Us has 1,000's of pages and over 10,000 charts on a subscription basis, but you can check out the site for free until December 14. In late 2008 it took 85 ounces of silver to buy an ounce of gold. That was a great time to buy silver relative to gold. In April of 2011, when I sold all of my silver, it took roughly 33 ounces of silver to buy an ounce of gold, a great time to dump silver for gold (or as it turns out, an even better opportunity to go to cash or treasuries). It remains to be seen if this is a good opportunity to buy silver, but I like my chances, not only because of the gold-silver ratio, but because I believe precious metals in general represent a good buy opportunity at this time. Swapping one precious metal for another is an easy transaction at GoldMoney. For further discussion, please see Physical Gold and Silver vs. Paper Gold and Silver: How Much Markup Are You Willing to Pay?